A traditional line dance, dabke (Arabic for “stomping the ground”), is danced in Lebanon, Syria, and Palestine at Muslim weddings and other celebrations and has been adopted, as debka, by Israelis. Rooted in these highly rhythmic and improvisational styles, ZviDance‘s contemporary dance was created by Israeli-born, New York–based choreographer Zvi Gotheiner, inspired by the Arab Spring to explore issues of identity with a passionate vision of cross-cultural community. Come at 6:00 for a free dance class. Marleine Aflak teaches traditional Lebanese dabke and Ruth Goodman and Danny Pollock teach Israeli debka. During the ’40s and ’50s, swinging nightclubs in the Casbah of Algiers regularly featured the scandalous sounds of chaabi, with its bittersweet vocals, lush strings, plucked ouds, jazz-influenced piano, and clapping hands. 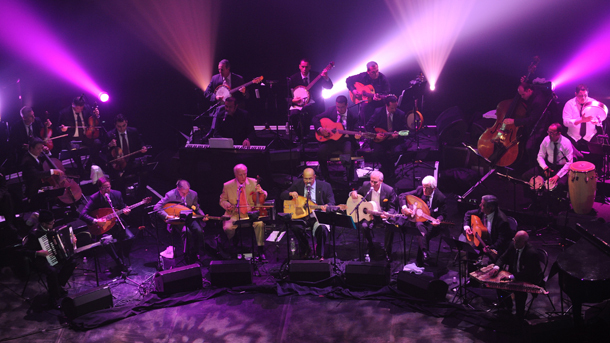 El Gusto was a darling of this scene, uniting Algeria’s top Muslim and Jewish musicians until they were scattered by the 1962 revolution that ended colonial rule and sent Jews into exile. After a half-century apart, a documentary by filmmaker Safinez Bousbia has reunited the old friends of El Gusto—now octo- and nonagenarians—to make music as joyful as ever. The members of the US-Algeria Business Council (USABC) are proud to be among the sponsors of the USA Tour of El Gusto. The USABC is the leading voice of business in trade between the United States and Algeria and works tirelessly to achieve its mission of expanding positive commercial relations and diversifying trade between Algeria and the United States.